VOSA APPROVED TO WORK ON MOTORCYCLES SINCE 2010. All motorcycles will be road tested by a qualified technician to ensure all work has been carried out to a satisfactory standard. 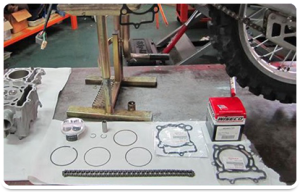 After any service or MOT our qualified technicians will road test your bike to make sure you are ready for the road and all work has been carried out properly. Being bike enthusiasts, our team take extra care to make sure each bike is given extra attention and care when carrying out any job ensuring every bike gets the star treatment. Is your bike running a little sluggish? Colin’s mechanics can give your bike a good clean down and a bit of tlc to nurse it back to full health while improving the performance. 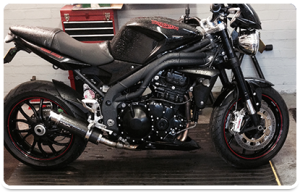 Our team at Colin’s is qualified to carry out mechanical repairs on your motorcycle along with servicing, MOT’s and repairing and fitting tyres. 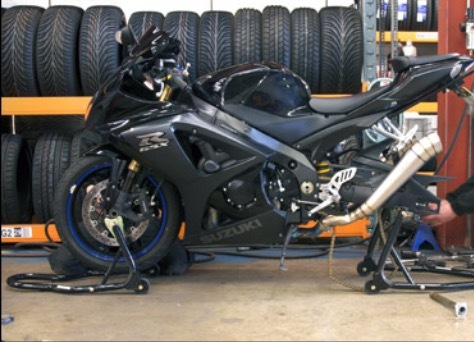 COLIN'S SUPPLY AND FIT A WIDE RANGE OF TYRES FOR MOTORCYCLES. IF YOU REQUIRE A SPECIFIC BRAND OF TYRE FOR YOUR BIKE WE WOULD BE GLAD TO ORDER IT IN FOR YOU SHOULD WE NOT HAVE IT IN STOCK. Feel free to get in touch with any queries you may have. We are always ready to help and our team are sure to have the answer to any questions you may have. So contact Colin’s today and let us take care of your pride and joy.